WEBSTER PARISH, La. — The American Civil Liberties Union (ACLU) has filed suit against a school district in Louisiana on behalf of a professing Christian mother who is unhappy that teachers, principals and others in the district have promoted Christianity during school hours and at school events. “Since enrolling two of her daughters in the Webster Parish School District more than 12 years ago, Plaintiff Christy Cole has become increasingly alarmed by the pervasive religious indoctrination to which students in the district are subject,” the suit reads. One of her daughters has since graduated and the other is still in high school. “Christy Cole believes her daughter and all students should be able to attend public school without exposure to government-sponsored religious practices and messages, and without harassment for their religious beliefs,” the complaint explains. While Cole was brought up in the Baptist denomination, and says she values her faith, she still objects to Christianity being promoted in public schools and believes that “praying in public is a sin.” At least one of her daughters identifies as agnostic. Cole says that students read a prayer daily over the loudspeaker, and that prayer is incorporated into sporting events and assemblies. 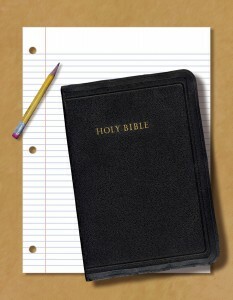 Christianity has also been discussed by teachers at times, and graduation ceremonies are held at local churches. Cole additionally states that in 2014, eighth grade students were walked to the gym to be introduced to the Fellowship of Christian Athletes group. The school went on lockdown due to a security issue at the time, and one of the representatives of the Fellowship decided to preach to the students. Cole says that a student began crying because they did not want to hear the message, and that her daughter was also upset that she could not leave. The following day, a local minister spoke to students during a Veterans Day assembly. Cole and the ACLU are seeking a declaratory judgment that the district’s practices violate the Establishment Clause of the U.S. Constitution, as well as an injunction against any further promotion of Christianity. Read the complaint in full here. The district has not yet commented on the matter. The first textbook used in the American colonies even before the nation’s founding, “The New England Primer,” was likewise largely focused on the Scriptures, and was stated to be popular in public and private schools alike until approximately the early 1900’s. It used mostly the King James Bible as reference, and spoke much about sin, salvation and proper behavior.